In today’s competitive market, it’s not enough to just sell quality goods and services at competitive prices—especially in Reisterstown, MD. You need to provide a retail setting that your customer will find aesthetically pleasing. That can be a difficult task for a restaurant, showroom, or warehouse setting in the Reisterstown area. Even department stores can find it tough to mix the right amount of ambiance with the day to day business of a working retail establishment, and safety of employees and patrons alike. In a soft goods retail establishment, you need to pay heed to the upkeep of your store, while worrying about safety of your customers and the wear and tear on your floor from foot traffic, carts, spills and many other posed threats. Beauty Salons, Barber Shops, Nail Salons and food sellers all have their own set of concerns when it comes to their flooring. For easy care, aesthetics and safety, most retail establishments choose protective retail floor coatings. Left unprotected your concrete floor can easily become stained, cracked or broken, not just off-putting in appearance, but downright dangerous and a significant liability. Courtrooms across the country see “slip-and-fall” suits brought against retailers on a near daily basis. You need to protect your customers, your employees and yourself by protecting your cement floor with retail floor coatings from Prestige. Why Coat Reisterstown Retail Floors? As stated above, many stores and restaurants have several different areas under one roof. The kitchen of an upscale restaurant can get pretty crazy on a Friday or Saturday night. If you’re a restaurant owner, you understand that clean-up is just as important as protecting the safety of your kitchen staff. When you install Prestige specialized retail floor coatings, you’re not just providing a safe working environment, and an easy-to-maintain floor in your kitchen, you’re lending the rest of your establishment an aesthetically pleasing floor as well as boosting your patrons’ safety. Manicurists and hairstylists alike will appreciate retail floor coatings in their salons. Aesthetically pleasing, easy care, slip and skid proof, retail floor coatings from Prestige Floor Coatings cover all the bases for any store, restaurant or other retail environment. Our superior product comes in several colors and textures and, once applied by our professional installation team, Prestige retail floor coatings will last for years to come. What makes retail floor coatings from Prestige the preferred product? First, our product is extremely durable. We employ our own staff chemists and our floor coatings are formulated specifically for the northeast, so they will stand up to temperature extremes. Our industrial strength coatings won’t show abrasions, stains, or impact. Our retail floor coating won’t crack, split, or peel, and stay skid-proof, even if there’s a spill. Professional installation takes 2 to 3 days, depending on the size of the project. 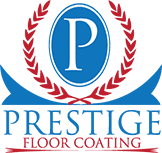 The professional team at Prestige Floor Coatings will make sure your floors are even, any cracks or crevices are repaired, and your concrete floor is in the optimum shape to apply our retail floor coating. Once the base and color are applied, we seal the deal with a highly durable top coat. As a retailer located in Reisterstown, you can count on Prestige for a high-quality product, installed to your complete satisfaction. We understand how much your business means to you. Protect your floors and your livelihood with retail floor coatings from Prestige. Contact Prestige Floor Coatings today to find out how you can protect your retail establishment in style.